Because I am great-grandson, son and brother of painters, I consider painting as my closest environment. Pentimento is an italian word common to the pictorical language and is used to refer to the parts of a picture painted on the canvas that the artist "repented of" and hurried to correct by covering them up, but with the passage of time they "climb out" or appear and become visible. And likewise, the score attempts to be a transposition of the pictorical phenomenon to the musical staves. What was underneath in the case of Pentimento is a fragment of a string quartet which in the second section of the work "climbs out" more or less timidly, reaching at times emphasis and clarity. 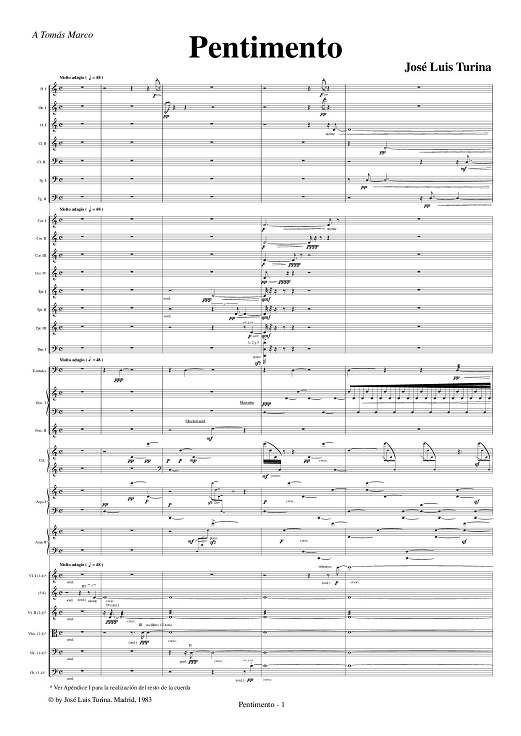 Pentimento is a piece for large orchestra, that obeys to a tripartite form. The introduction starts out of nothing, by means of an imperceptible sound by the strings, to which the rest of the instrumental families gradually incorporate themselves by musical figures that form like an ornamental garland and accompany the development of the strings, basically made up with eight rhythmic cell which gradually appear together with a harmonic and progressive development (of one to twelve simultaneous sounds). The intensities and expressive dynamics have in this process a decisive role. With no interruption and after the climax of the first section, the instruments gradually fade away as well as the figures and intensities to, in a natural form, lead us to the apparition of the string quartet, whose presence, more or less veiled and dialoguing with the rest of the orchestra, is the basis for the central section of the work. The quartet gradually asserts itself over the orchestra in a type of writing that, though it begins by combining an atonal part with a tonal one, openly leads into the latter, in a great choral variation of the harmonic change of key with which culminates the scene of the consecration of the Holy Grial in Wagner's Parsifal. It can be said that this work is a tribute of admiration to Richard Wagner, its undertaking coinciding with the centenary of his death, given that Pentimento was composed in Cuenca between the months of January and March 1983 (we will recall the fact that Wagner died on February 13th, 1883). The culminating point of this choral variation arrives when the at the beginning timid apparition of this harmonic change of key in the quartet acquires a complete presence in the wood and brass sections. The third and last part, in which the "repentance" is no longer perceived nor is present, is a short recapitulation of the first section, worked in a retrograde way; that is to say, starting from the climax that ended the first part, the intensities slowly fade away, and the eight rhythmic cells of the strings gradually diappear to conclude in a tenuous sound –quasi niente- with which the piece begun. Pentimento, composed on a commission of the Spanish National Orchestra for the 1983-84 season, is dedicated to Tomás Marco. It was premiered by the orchestra in February 1984, conducted by Jesús López Cobos.